UPDATE 1: The Department of Transport (DoTr) will review the Implementing Rules and Regulations of the ADDA. See below. (5/20). That’s going to be a big problem since the screen is fixed. Eri pointed that out as well. 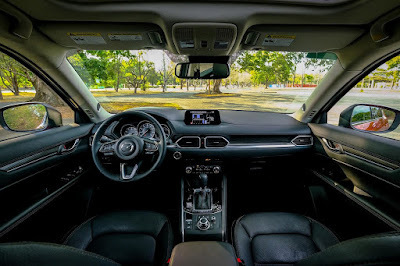 Even before the implementation of RA 10913, or the Anti-Distracted Driving Act, Mazda has already included built-in features that allow drivers to be safely connected with their smartphone, while also being entertained, on the road. Mazda Connect is the infotainment system available in all KODO-generation Mazda models. Its human-centered design aims to minimize visual, cognitive, and manual distraction. This advanced infotainment system allows the driver to control and manage data and select entertainment options while keeping his attention focused on the road ahead. With either its 7- or 8-inch touchscreens strategically located below the windshield line and just at the middle of the dashboard, the system was designed from the start not to interfere with the driver’s line of sight and instead enhance driving ease by positioning vital vehicle information at a slight glance. With safety as the top priority, the Mazda Connect touchscreen feature is disengaged once the vehicle is in motion. This is when the intuitive layout and location of the Commander Control knob and its surrounding five buttons and accompanying volume dial, as well as the steering wheel control switches, take over and allow the driver to manage the system while keeping his head up and his eyes on the road. Mazda Connect also lets the driver pair his mobile phone via Bluetooth for a true hands-free call experience. The system has a built-in microphone to pick up spoken voice while the car’s speakers pass audio through so the driver doesn’t have to hold his phone while listening to the caller speak. Through Voice Control and Recognition, Mazda Connect also reads out SMS text and allows the driver to reply with preset messages. Controlling the system’s functions through simple spoken words is yet another feature that demonstrates Mazda’s focus on safety while driving. Mazda has been at the forefront of driving safety and convenience since the first Mazda Connect system was introduced in the current Mazda 3 in 2014. It is the first mainstream manufacturer to use a rotary controller paired with an in-dash screen, a feature previously found only in luxury brands. The Mazda Connect system undoubtedly leads the way to safer and more convenient driving. The shot was simply taken lower, but any Subaru owner would know that the placement of the mobile phone blocks the multi-information display and clock which both aren’t in the driver’s direct line of sight. Atty. 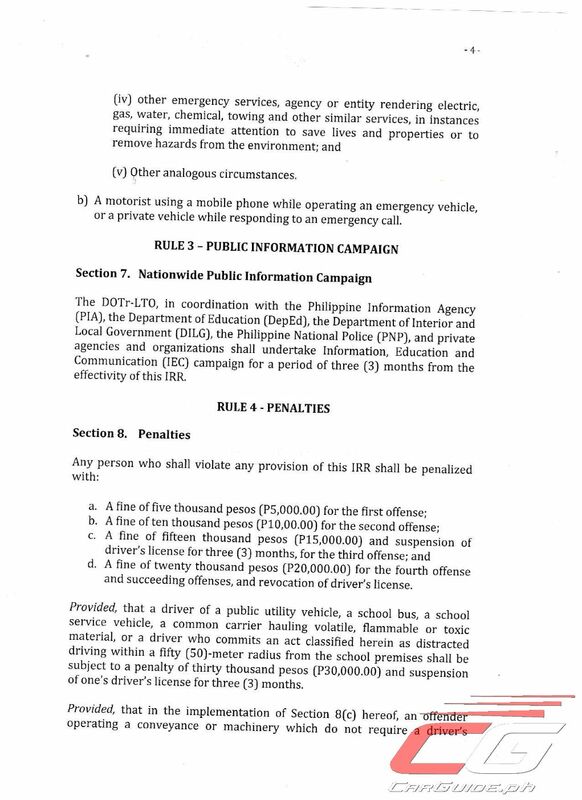 Robby Consunji, a columnist for monthly motoring magazine Top Gear Philippines went so far to dissect the Implementing Rules and Regulations of the ADDA (a copy of which is available below). The installation of the mobile device within the line of sight WITHOUT using it on hands-free mode is arguably NOT punishable. 2) the installation within the line of sight. If you are apprehended, just take the ticket and inform the enforcer that you will contest the matter. File the protest at the LTO adjudication office. 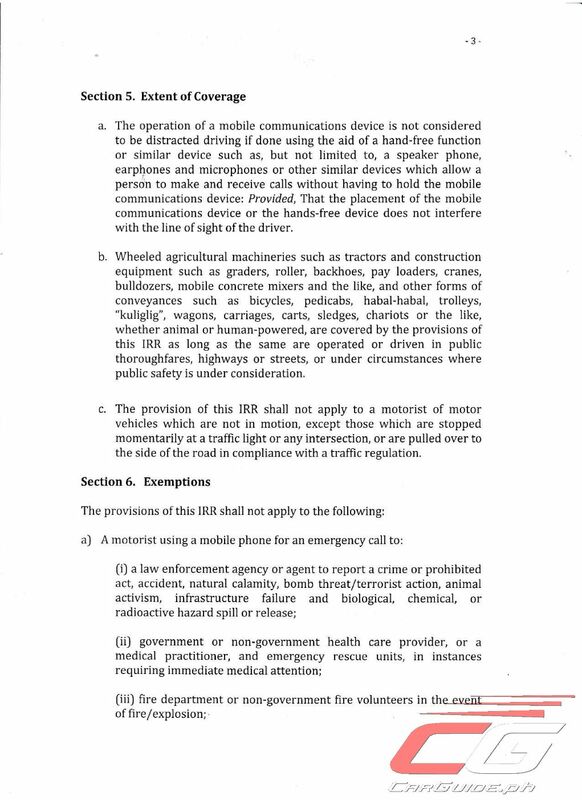 In summary, IRR seems to read that the mere mounting of a device on the windshield is not punishable under the ADDA. It’s only punishable if it’s being used on hands-free phone and it’s installed within the line of sight. Oh, and “floating infotainment screens” found in vehicles such as Mazda is allowed. Of course, we’ve yet to get to the subject of heads-up displays and that could mean another problem altogether. There’s no doubt that the recently enacted Anti-Distracted Driving Act is good. We’re all for it. 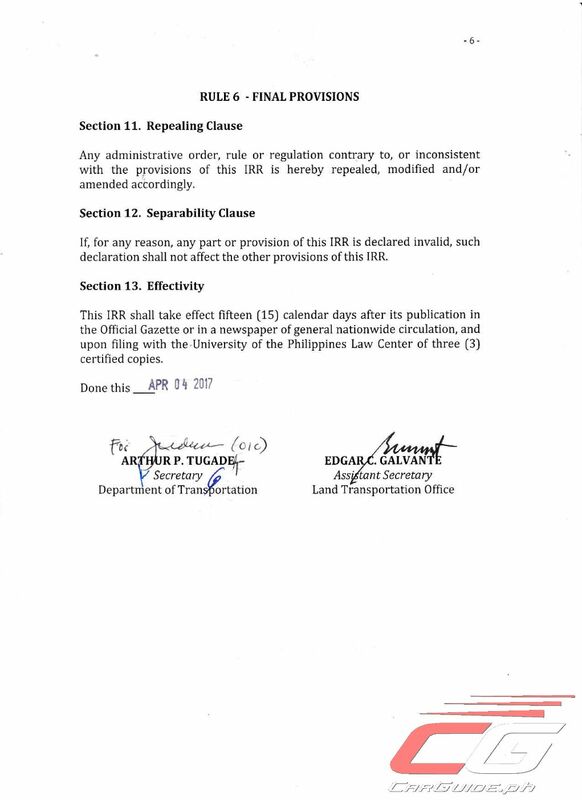 But, there are obvious loopholes in the IRR drafted. 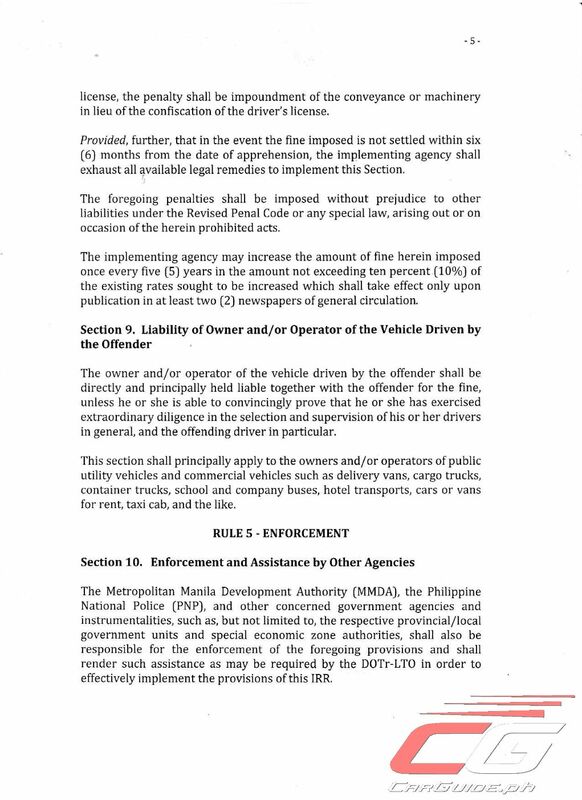 The Department of Transport (DoTr) will need to sort this entire thing out or make amendments. 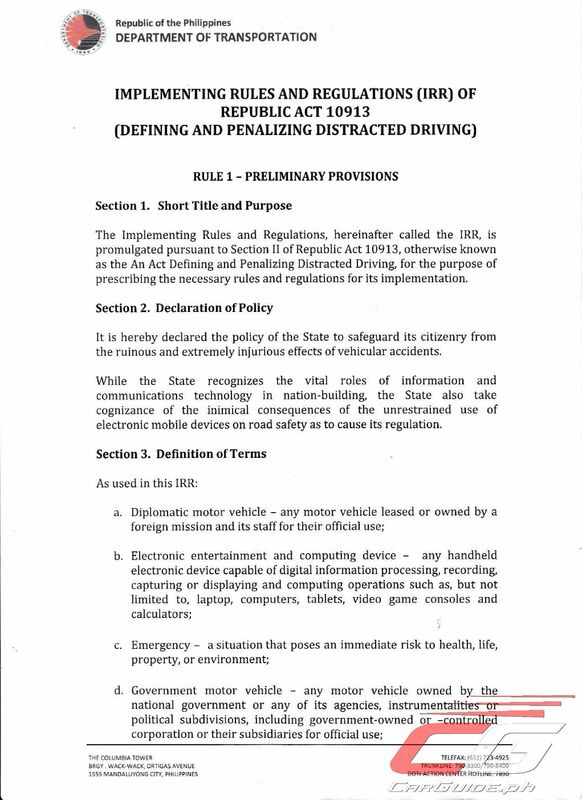 Here’s a copy of the Implementing Rules and Regulations of the Anti-Distracted Driving Act. See if you can draw your own conclusions. 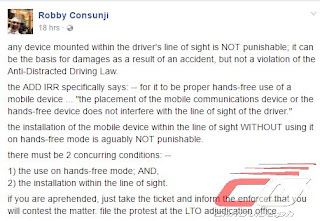 UPDATE: In a report published in The Philippine STAR, the DoTr and the LTO will be reviewing the Implementing Rules and Regulations of the Anti-Distracted Driving Act after it caused widespread confusion among motorists and enforcers. The report says that one senator, Senator Joseph Victor (JV) Ejercito, said that the new rules were practically incomprehensible. This is on top of confusing and/or conflicting statements issued by the LTO, DoTR, and the MMDA. "Thank you for clarifying the placement of the dashcam. However, in DOTr's reply to query no. 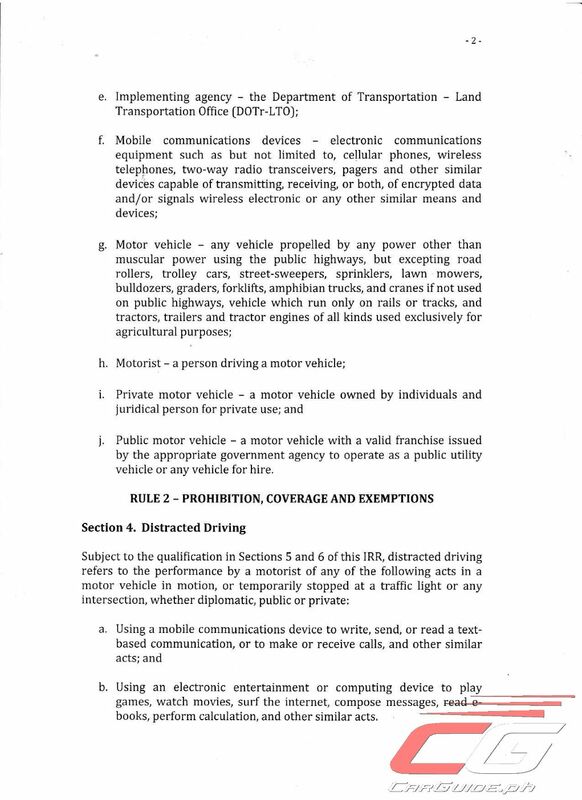 6 pertaining to mobile devices, as stated: "Gadgets with these applications may be installed in areas shown in the picture below, or other areas that will not obstruct the driver’s view." The image shows suggested location. In DOTr's answer: "or in areas that will not obstruct the driver's view." As clearly shown in the image sent to you, the mobile phone does not obstruct my view. Is this still prohibited? 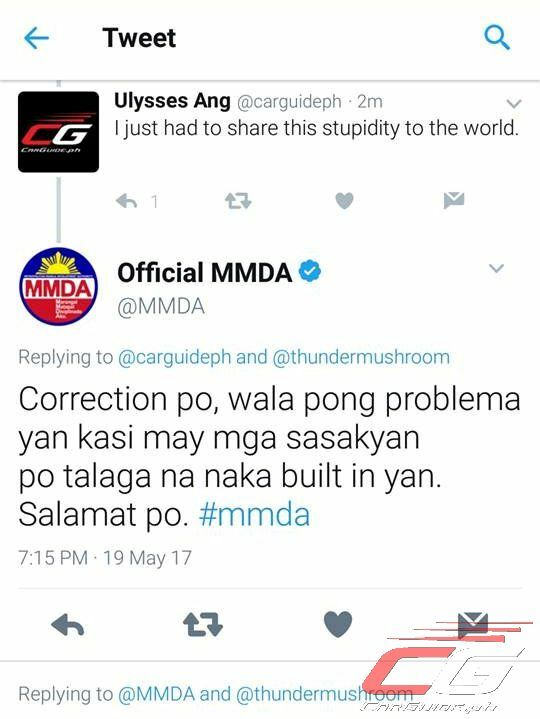 Because if it is, it is contradicting DOTr's statement. Please clarify. Thank you." The IRR should be just as simple as you should not be holding any mobile device or gadget while driving. If it is this simple then there will be no problems when apprehended. They way it is now it is open to a lot of interpretation by the MMDA or any apprehending officer. Amend na yan. Di pinagisipan ng maayos itong batas. It's clear that this wasn't studied well before passing. Now there are different sources telling what is right and wrong but they all come up with different answers. You might as well keep the phone first or avoid using an external nav device such as your phone or GPS. Lucky if you have Bluetooth handsfree on your car with nav, or better yet Apple CarPlay or Android Auto. This law is stupid and probably have not been researched at all. Hands-free mounts that are mounted on the windshield helps the driver avoid looking down on his phone and other devices, it acts like how a rearview mirror assists a person looking behind him without turning his head. Hi same with my concern. We have built in tv in the car stereo together with multi media,navigation and radio. Is this also allowed or a violation? Thank you. Ok ang batas. Ang mga nagiimplement ang mga boblocks sa pagintindi nito. Walang nabanggit buong windshield at dashboard sa batas, pero dinamay nila ito against sa line of sight. Yun mga eye level installation dapat ang bawal. Paatras talaga tayo. 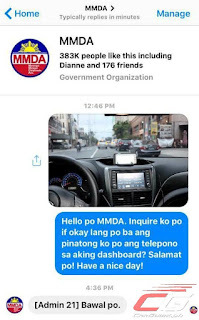 MALINAW ANG BAWAL IS GAMITIN YUNG MOBILE PG NG DRA-DRIVE KA...MG TEXT AT SUMAGOT NG TAWAG...PERO PG NAKA HEADSEAT KA OR MY BLUETOOTH HEADSET PWEDE YUN..
Siguro dapat unahin muna nila yung regulation sa tint ng windshield at front occupant windows. 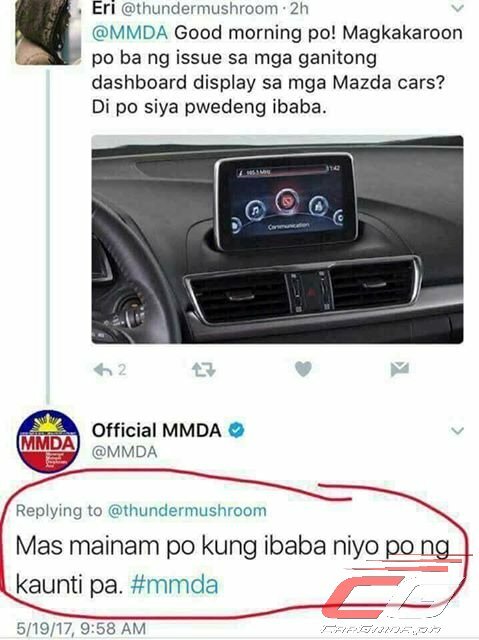 Kasi kahit anung batas pa yan na gawin nila about anti-distracted driving, e hindi nila makikita yung violators kung heavily tinted ang sasakyan lalo sa harapan. Ang Lakas makabobo ng batas na yan..wala nga yata silang data kung ilang percent ang naaksidente dahil sa mga bagay na nasa dash board ng isang sasakyan..pati sign sa bus ay at jeep gusto ipatanggal..pati rosary bawal na rin?eh wala pa naman ako narinig sa news na naaksidente dahil nahilo sa katitingin sa rosary sa may ilalim ng rear view mirror..ang daming problema ng Pilipinas..wag sila dyan mag concentrate..di makakatulong yan sa pag lutas ng trapik sa edsa..
"Magkakaroon po ba ng issue sa mga ganitong dashboard displays sa mga Mazda cars? Di po siya pwedeng ibaba." "Mas mainam po kung ibaba niyo po ng kaunti pa."
dpat mging focus nila maintenance ng mga sskyan. certificate na every 6mos npapa change oil, brakes, etc. mali focus nila dito. lalo na mga bus and trucks, mga jeeps..haay. ! Pwede ba, Yung binabayaran namin na License Plate at License Card muna ang resolbahin nyo LTO! Sabi nila 'should not obstruct line of sight'. Sino mag-e-evaluate nun? Eh di 'yung driver din? I wonder if those who invented this drive vehicles themselves. Para kasing basta magka-KPI lang yung dating... Sana may data man lang or study ba. Susunod nyan, bawal na ang windshield.